april showers bring may flowers...on my pants? apparently so! i love these cute floral printed leggings from very jane! it is an adorable "daily deal" type online shop but they always have the cutest items for women, baby, and home! before i was less interested in all the baby stuff people try to sell you on but these days i am a total sucker and love everything baby that i see! it is such a cute site and i recently noticed they were doing a deal on lace pencil skirts so i may even have to head back over! i also about died when i saw this color of blouse at f21 the other day, i don't think the pictures quite do the color justice but it was definitely the perfect spring color that i needed to add to the closet and it couldn't have paired better with these leggings! You look gorgeous in this color! giiirrrrrl you lookin so good! love this outfit! I love it all! You are so stunning. Especially in those earrings! Thanks, Robyn! And I love seeing that tiny baby bump. So dang cute. Hope you're feeling great! This could quite possibly be my favorite outfit you have ever posted!!! I LOVE it!! 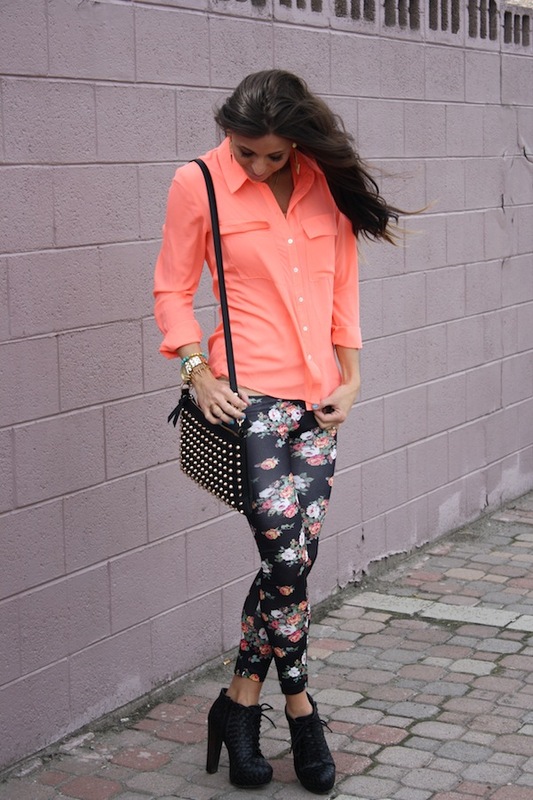 Oh my goodness, these are killer floral leggings! That top is amazing! And you're right it goes with those leggings perfectly! Those leggings are so cute! I have been really digging the printed legging look lately, especially aztec or galaxy or tie dye (apparently everything?!) You look very cute and the color really pops on you. Love it! Love the leggins, almost bought them on Vey Jane that day! Love them with the coral top, its an awesome color! This outfit is so different than what you normally do and I LOVE it!! Love the coral top and your earrings! Those earrings are so unique I love them. This is one of the best outfit posts that I have seen! Great color on you! So pretty!